1Fabrizio Di Maida, 1Andrea Mari, 2Cristina Scalici Gesolfo, 1Riccardo Bossa, 3Antonina Cangemi, 1Riccardo Tellini, 3Giuseppe Cicero, 1Emanuele Avola, 4Michele D’Arienzo, 3Antonio Russo, 1Andrea Minervini, 2Simonato Alchiede, 2Vincenzo Serretta. 1 Department of Urology, University of Florence, Careggi Hospital, Florence, Italy. 2 Section of Urology, Department of Surgical, Oncological and Stomatological Sciences, University of Palermo, Palermo, Italy. 3 Section of Medical Oncology, Department of Surgical, Oncological and Stomatological Sciences, University of Palermo, Italy. 4 Section of Orthopedics, Department of Surgical, Oncological and Stomatological Sciences, University of Palermo, Italy. Introduction: Epidermal Growth Factor Receptor (EGFR) overexpression is recognized as a marker of biological aggressiveness in several tumors. Studies in non-muscle-invasive bladder cancer (NMIBC) are lacking. We investigated the feasibility of EGFR measurement in bladder washings and its prognostic role to determine disease recurrence and progression in identifying risk subgroups. Methods: Patients with NMIBC treated with transurethral resection of bladder tumor (TURB-T) from 2012 and 2015 were enrolled. RNA was obtained from bladder washings after TURB-T and during intravesical adjuvant therapy. EGFR expression was evaluated by reverse transcription. EGFR overexpression was defined as a ≥2.0 increase compared to healthy controls. 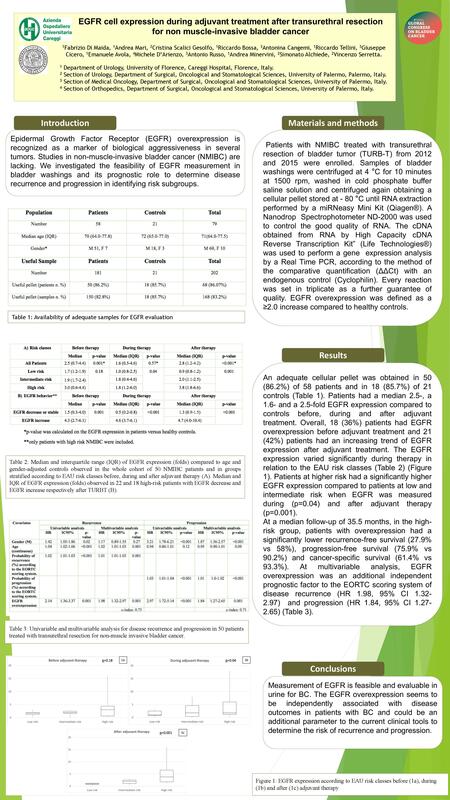 Results: An adequate cellular pellet was obtained in 50 (86.2%) of 58 patients and in 18 (85.7%) of 21 controls. Patients had a median 2.5-, a 1.6- and a 2.5-fold EGFR expression compared to controls before, during and after adjuvant treatment. Overall, 18 (36%) patients had EGFR overexpression before adjuvant treatment and 21 (42%) patients had an increasing trend of EGFR expression after adjuvant treatment. 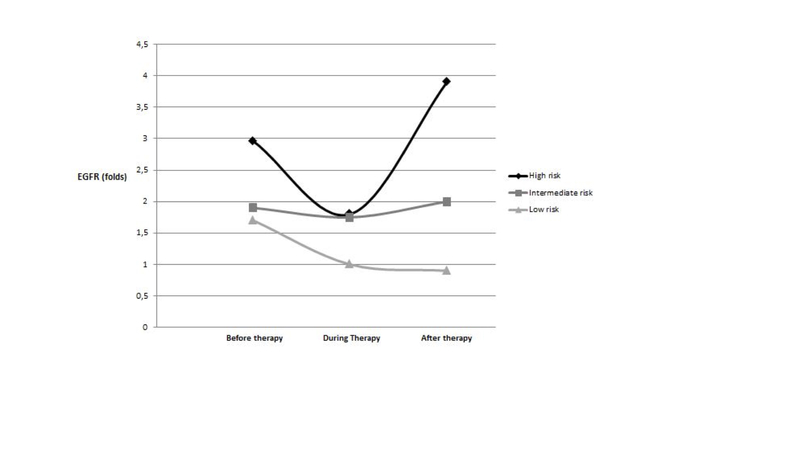 The EGFR expression varied significantly during therapy in relation to the EAU risk classes (Figure 1). Patients at higher risk had a significantly higher EGFR expression compared to patients at low and intermediate risk when EGFR was measured during (p=0.04) and after adjuvant therapy (p=0.001). At a median follow-up of 35.5 months, in the high-risk group, patients with overexpression had a significantly lower recurrence-free survival (27.9% vs 58%), progression-free survival (75.9% vs 90.2%) and cancer-specific survival (61.4% vs 93.3%). At multivariable analysis, EGFR overexpression was an additional independent prognostic factor to the EORTC scoring system of disease recurrence (HR 1.98, 95% CI 1.32-2.97) and progression (HR 1.84, 95% CI 1.27-2.65). Conclusion: Measurement of EGFR is feasible and evaluable in urine for BC. The EGFR overexpression seems to be independently associated with disease outcomes in patients with BC and could be an additional parameter to the current clinical tools to determine the risk of recurrence and progression.